Discussion in 'LOR 240V AC' started by penguineer, Sep 18, 2012. This is a bit of a continuation of the discussion over in the trading area related to getting built boards, but no cases and how to connect them up. 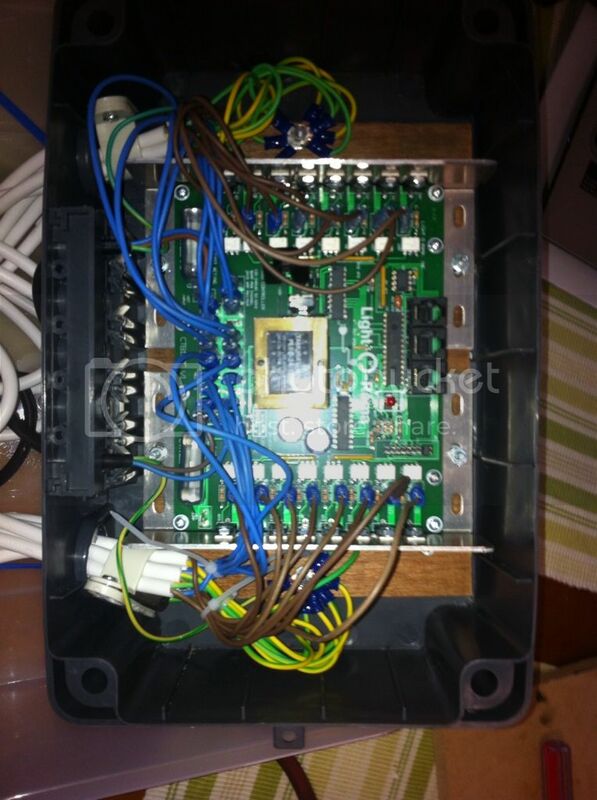 So far there's been talk of using 4port power boards and short extension leads for the outputs. Notice that the earths(blue ring terminals on green/yellow wires) are all joined together on the strain relief. Strain relief would be one of my concerns if putting one of these boards in a Masters case, but should be simply dealt with. - fit a large bolt with the thread upwards through the mounting board, somewhere towards the bottom but not in the way of the cable entries. This will be the earthing point. This should be fine as is, if the box is mounted upright, could use a bit of silicon to seal the hole or use a proper cable gland on the output cable holes(do this before putting the cables through). Comms cables through the "normal" rubberised glands at the bottom of the case where the power inputs are. Does this sound reasonable? Suggestions? I didn't buy the strain relief thingies when I got my LOR boards so i had a bit of a similar issue. I joined all of my earths via twin screw (earth) bluepoint connectors and then taped over the whole thing. I also used cable ties as the strain relief device. You could use hose clamps but if you do then you will need to earth them. 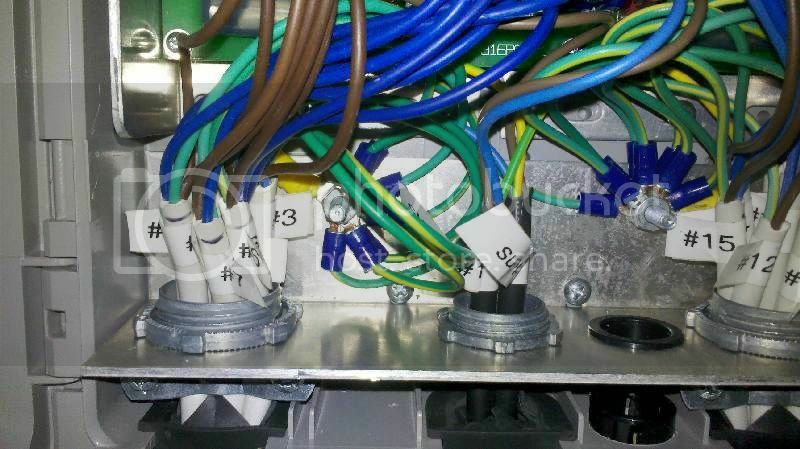 The heatsinks on the boards are "live" and shouldn't be touched when power is supplied. I think from memory that they are connected to the neutral of the mains supply. Any other metalwork that you have in the box and in particular any that goes from inside the box to outside where it can be touched SHOULD be earthed. The only picture that i have of mine online doesn't show things well and it wasn't the neatest work I did. The image below is a single screw bluepoint connector. Also known as BP's, BP connectors and just connectors. 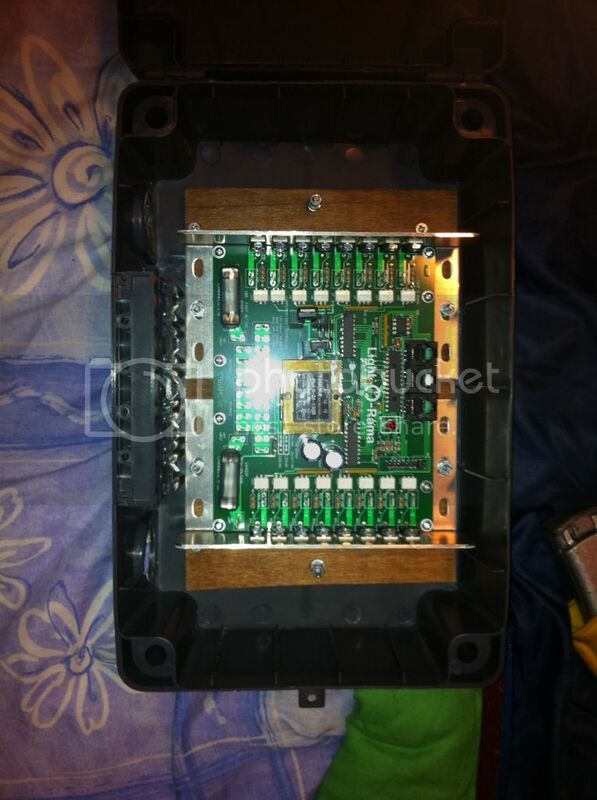 The heatsinks on the boards are "live" and shouldn't be touched when power is supplied. I think from memory that they are connected to the neutral of the mains supply. I thought LOR used isolated tab TRIACs and that the heatsink was not live. I can dig out a board to confirm later. If the bolt used for the earth commons is going through plastic or wood (ie. not metal), the various earth ring terminals should be captive between two nuts. This is so the ring terminals will remain in tight contact with each other even if the wood shrinks with age (likely) or the plastic melts for whatever reason. So, the layers would be bolt head, wood / plastic, lower nut, ring terminals, star washer and the top nut. Aside from the star washer that's what I did. I just checked and the CTB16PC (120V / 240V) board does use isolated tab TRIACs. This means the heatsink is not live. It also means you must use the same (isolated) type if you ever do replace a TRIAC. 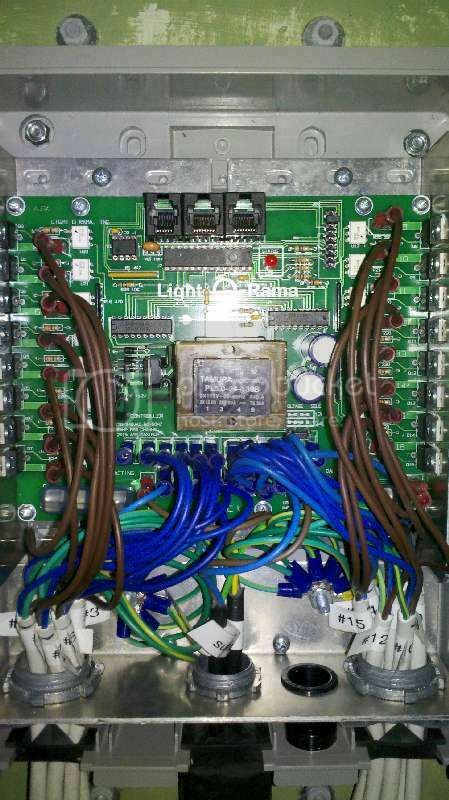 If in doubt, please ask before powering the board up after repairs. It's always a good idea to check with a meter (on a high Ohms range) to make sure there is no leakage from the mains to the heatsink anyway. Might like to consider a short earth tail from each of the power inputs onto the metal back plate as there is high possibility it could become live from a stray connection without going to earth. It looks to be suitably earthed in the LOR box as the fasteners between the plates would provide a suitable connection.